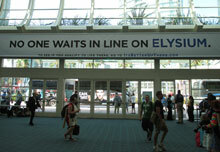 Here’s the story of Comic-Con in pictures, beginning with preview night and the first full day Thursday. See also Part 1, and Part 2. Shore Leave (The Venture Bros.) and Slave Leia strike a pose for onlookers. 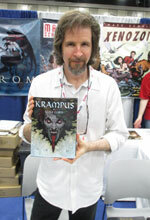 Famed illustrator Brom with his new Krampus book, featuring a character that’s increasingly part of the holiday zeitgeist. Showing the complications of trying to relate print to digital at the Madefire booth, here’s the rough art for a 3-D room that readers can navigate in one of its digital comics. 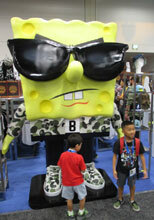 Despite its age, SpongeBob remains a character with the ability to adapt to new eras, here with shoes from Bait (see "Where Sneakerhead and Vinyl Culture Meet"). 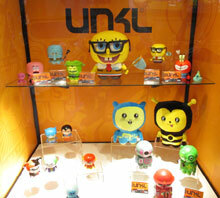 And here with figures from Toynami. 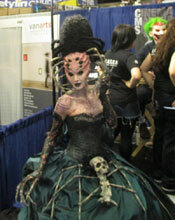 At the Cinema Make-Up School booth, showing off their handiwork. 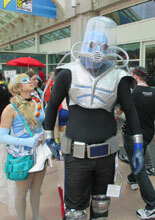 Mister Freeze seems ot have an admirer! "By the power of Grayskull..." It’s She-Ra and He-Man! 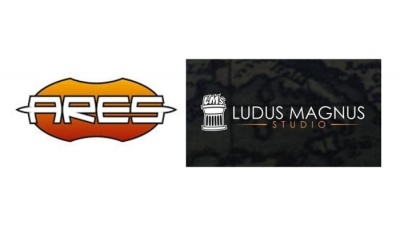 Two layers of marketing: an Elysium banner inside and a Grimm bus outside. 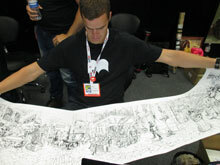 Artists working on the comiXology Hero Initiative mural Thursday evening, soon to be auctioned for the charity. 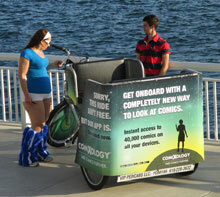 ComiXology sponsored a fleet of pedicabs; this one was parked behind the Hilton Bayfront, where the Hero Initiative piece was created. Click here to go back to Part 1.